We woke up early again, to brilliant sunshine. The folks at our B&B had promised breakfast at 8:00 a.m., but since we were up by 6:30 they took the hint and prepared it early. By eight we were on the road. We backtracked a few miles and stopped in for a quick visit at the Cloudy Bay Vineyards (having already visited the Bay itself at happy hour). It was way too early for them to be open for visitors, but at least we could say we had been there. Then it was back on the road, heading west and inland, towards St. Arnaud. We drove through the heart of the Blenheim wine country, and it was very impressive. The valley floor was fairly flat, with the mountains rising up sudden and steep on either side. We passed winery after winery; the level ground was filled with thousands of rows of grapevines, with the majestic mountains of the Richmond Range forming a magnificent backdrop. We had known that this was wine country, but we had no idea that there would be such a vast expanse of vineyards. Montana , Brancott, Stoneleigh, Cloudy Bay , Saint Clair, Fromm, Drylands, Allan Scott; these are just a few of the wineries we passed. As we continued west, the road began to steadily climb, and it became quite twisty. 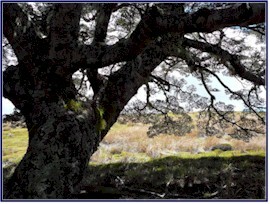 As we entered an area called �Six Mile Scenic Reserve,� we rounded a bend and saw two wild pigs in the road. They were as surprised as we were, and they quickly disappeared into the underbrush. 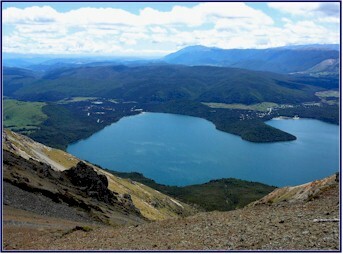 When we reached St. Arnaud we visited the Department of Conservation (DOC) information center to learn about the hiking in the area, and then we headed for Lake Rotoiti , in the Nelson�s Lakes National Park . One of the most fabulous things about New Zealand is its parks. Huge portions of the country are in National Parks, Scenic Reserves and Conservation Areas. Much of this land is wilderness, with no roads through it, accessible only by helicopter or on foot. The DOC does an excellent job of maintaining the parks and hiking tracks. This system is truly one of their national treasures. The track wound upward through the shady forest. The beech trees had an almost mystical quality, with moss hanging off the branches and twigs. Birds darted to and fro, their songs ringing out in the quiet woods. The path grew steeper; it criss-crossed the mountainside with dozens of tight switchbacks. We went back and forth, coming out into the bright warm sunshine, and then going back into the cool shade under the trees. The trail was fairly smooth and even, but unrelenting in its climb. Soon we were sweating and gasping for breath in the thin high-altitude air. 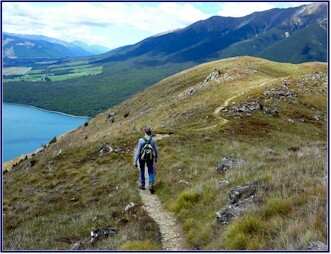 As we continued to climb, we could well imagine how the Pinchgut Track got its name. But the views were magnificent! As we neared the top, back among the trees again, we were feeling knackered. We would stop every little while to catch our breath, and then force our tired legs to keep going. By this time we had been climbing for an hour and a half, and I don�t think there had been a level step the whole way. Our goal was to make it to the camping hut at the top of the mountain ridge before heading back down. As we huffed and puffed up the track, and stopped to rest, an extremely lean and fit looking man came jogging - yes, JOGGING!! - up the trail, right where the switchbacks were the steepest. Damn! He wasn�t even breathing hard. Jineen considered sticking out her foot and tripping him as he ran by, but at the last minute she masterfully restrained herself. At some point on the climb, Jineen lost her sunglasses. Later on, when she realized they were missing, she thought she must have put them down somewhere when we stopped to rest; my personal theory was that the mountain god took them as retribution for her uncharitable thoughts about the jogger. When we reached the top, we came out from the trees and climbed above the timberline, and it was amazing. We felt a great sense of accomplishment at having made it to the top, but also a real high, which infused us with a new burst of energy. 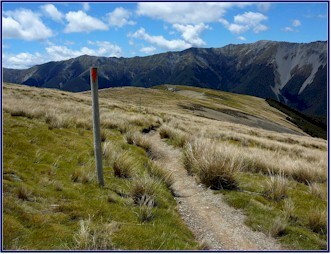 We decided that rather than turning back, we would keep going and do the whole loop trail, about a five hour tramp (NZ for hike). The path traversed along the top of the ridge, and the scenery was spectacular. On one side the mountain sloped upwards to a higher peak, but everything else was below us. On our way up, the higher we had climbed, of course, the further we could see. But now, the vistas that opened up in all directions were incredible. We felt like we could see forever. 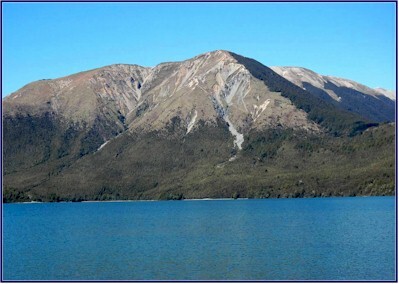 The turquoise blue waters of Lake Rotoiti were far below us, and the grandeur of the mountains behind it was breathtaking. We sat near the top with the world at our feet. We snacked on trail mix and Snickers bars. The birds were singing, the wind was blowing through the trees, and we could hear no other sounds. Time seemed to both stand still and to fly. 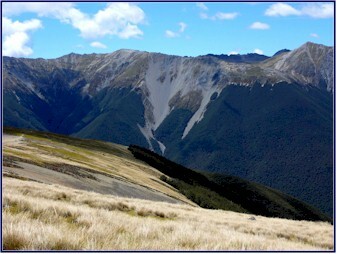 We continued on, following the path that wound along the ridge. The air was much cooler up at the top, and the wind was strong. At one point the trail crossed a narrow saddle where the ground fell steeply away on either side; as we came to this point the wind hit us like an icy blast. The temperature felt like it dropped twenty degrees in a matter of seconds, and I was scrambling to get that long-sleeved shirt out of my pack � the one I thought at lower altitudes that I wouldn�t need. We headed back by way of Paddy�s Walk. This was the longer route, and the trail was rougher and rocker. It wound back and forth across the high open spaces, crossing the mossy tundra-like terrain, and we could see it snaking down across the open mountainside before us. Following it, we crossed rocky scree-slides and streams with miniature waterfalls. Presently we returned to the forest. In one of the watercourses, we saw large cloven hoofprints. Were they made by deer? Chamois? Thar? Pigs? In the absence of evidence of any of the former three, we joked, we were forced to conclude that the wild pigs we had seen early that morning were stalking us. 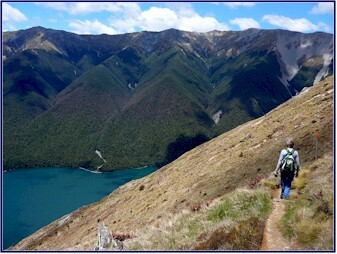 We traversed the lower section of the mountain, not far above the shore of Lake Rotoiti. We got back to the carpark four and a half hours after we had left it, exhausted but exhilarated. We stopped at the side of the lake to view Mt. Robert from below; we were really impressed by how far we had climbed. While standing by Lake Rotoiti enjoying the scenery, we glanced down and saw something moving in the water. There were giant eels living in the lake! They were three to four feet long and as big around as your arm, and they hung out under the small pier we were standing on. There was a sign prohibiting fishing for eels, but they would come to the surface to eat when we threw out breadcrumbs. 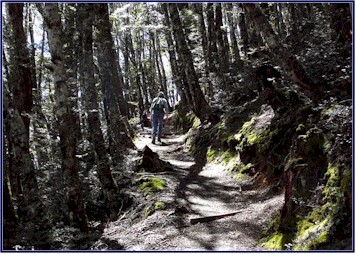 Back in the car, we continued on to Lake Rotorua , also in Nelson�s Lakes National Park . 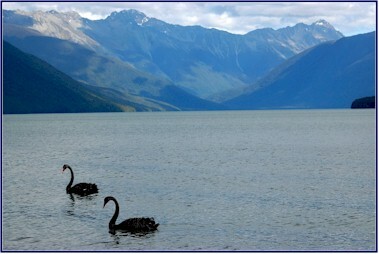 We had happy hour there; another scenic spot with lovely mountains behind the lake and black swans floating in front of us. We enjoyed crackers with cheese and chutney, and finished off the last of the Cloudy Bay . We headed for Murchison, where we planned to find lodging for the night. Rather than follow the main road, we found a tiny byway that wound its way back and forth along a small river. Yellow blossoming broom shrubs grew abundantly along the edges of the stream, making a bright contrast to the deep green of the mountains. The road went ever downward, as we had crossed the �continental divide,� and we were now following the river west, down towards the Tasman Sea . We drove through the Mangles Valley . The road became very narrow and winding, crossing streams with open fords. 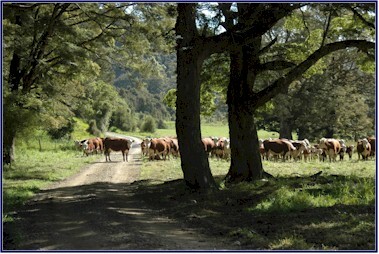 We saw a sign that said �Stock in Road,� and sure enough, we rounded a bend and found a herd of Hereford cows blocking the way. We politely requested that they move, and they graciously consented to let us by. When we arrived in Murchison, we started looking for a place to stay. We had been a little worried that it might not be easy to find lodging at the spur of the moment; when we came in 2004 it had been in November, and a few times it was hard to find a room. Being a month later in the year and that much closer to the peak season, we expected that it might be more difficult this time; but to the contrary, so far it had proved less crowded than two years ago. After checking several different possibilities, we found a lovely farmstay called Silverstone B&B, where we had our own little cabin with views of the surrounding mountains. We watched the farmer move cattle and run his dogs. Sheep were grazing outside our window. We had dinner at the Rivers Caf� in town; then it was back to Silverstone for a good night�s sleep. It was another beautiful day. We left our room early and headed into town to use the payphone to call home � only to find that you can no longer reach an AT&T operator from a payphone in NZ. Therefore unable to use our prepaid International calling card, we went back to the Silverstone B&B and begged; our hosts, Alf and Phyllis Kinzett kindly allowed us to use their personal phone. While we were making the calls, we chatted with them about the farm. We learned that in addition to sheep and cattle they raise a large number of red deer . The stags grow an enormous rack of antlers, and the Kinzetts raise them for the velvet on these antlers. It is sold to the Koreans, who use it in medicines and as an aphrodisiac. To harvest the velvet, they sedate the male deer and saw off their antlers. The deer shed their antlers each year anyway, and they grow an entire new set in 63 days! Like most NZ farmers, the Kinzetts have dogs to work the livestock. But they also have �pig dogs,� used to hunt the wild pigs. They told us that the wild pigs have gotten quite numerous; they damage crops and destroy the habitat of native birdlife, so they are considered a pest and commonly hunted to control the population. They told us rather lurid stories of tracking the pigs down with the dogs and then killing them with a knife. We learned that Phyllis Kinzett�s sister Kate lived nearby, and that she is a former Event Rider who raises horses. We arranged to visit her breeding farm. We took a short drive back up the Mangle Valley . Being a little early for our appointment, we explored the back roads for a while; never miss a chance to see what�s around the next corner. Then we went to Tiraumea Farm, where we met Kate Kinzett. She had enjoyed a successful Eventing career (highlighted by being short-listed for the 1988 Seoul Olympics) and is now breeding horses for Eventing, showing and foxhunting. She showed us her two lovely crossbred stallions, Ironman and Flint , and also her youngstock. 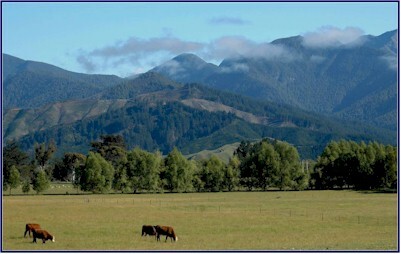 The mares and foals grazed in green meadows surrounded by majestic mountains. Leaving Murchison and heading west, we passed through the Upper Buller Gorge. This had been hyped in the guidebooks as something not to miss, but we found it disappointing. Was there a gorge here? You would never know it from the road. The river was quite a ways below the highway, but with the trees lining it, the views were few and far between. Apparently you had to experience the gorge in a raft or kayak to appreciate it. We stopped at a scenic overlook picnic area for a rare view of the river, and we were delighted to encounter a weka. This is a chicken-sized flightless bird that is indigenous to NZ; they are somewhat similar to a kiwi, but not nearly as rare. This one had become quite tame; he obviously made his living hanging out at the picnic area and begging scraps from tourists. We fed him some bread crumbs, and he was very appreciative. We continued on toward the west coast. We kept planning to stop in the next town for a coke, but it seemed that every �town� we passed consisted of something like two houses close together and a mailbox, and no place where we could so much as buy a soda. Even the �main highways� in New Zealand are for the most part fairly small roads, often very twisty where they go through mountains, essentially what would be considered very small back roads in the U.S. They drive on the left, of course, and sometimes they drive amazingly fast, even on the treacherous winding sections. As in the U.S. , broken lines on the road indicate where you are allowed to pass, but the difference is that in NZ you seem to be allowed to pass almost anywhere, including on tight curves and blind hills. I made a habit of pulling over to let overtaking cars by as soon as I saw them in my rearview mirror. We passed another Highway Department cryptic message; a sign with a picture of a car speedometer, with all of the numbers above 100 km/hr showing a dollar sign in front of them, representing the fines for speeding. I could identify with that one! As we came closer to the west coast we saw a lot more dead possums in the road: Jineen�s count made it 16 for the day, and that was only counting the fresh ones! 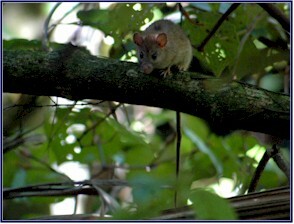 We had learned about the possums when we visited NZ in 2004. There are no native land mammals in New Zealand , which is one of the reasons there is such a rich and abundant variety of bird life. 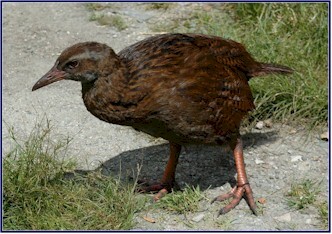 Because they had no natural predators, many flightless birds evolved, such as the kiwi, the national symbol of NZ. But the British will have their sport, and when they colonized the country they imported animals for hunting and trapping, and introduced them into the wild. Unfortunately, many of these introduced species have had devastating effects on the natural balance in NZ, destroying the habitats and food sources of the native birds, and raiding their nests. The Australian Possums, imported for their fur, have probably been the worst culprits. In their native country the environment naturally limits their population, but they thrive on the climate and food sources in NZ, and they have multiplied out of hand. It is now estimated that over 90 million possums inhabit the country, and they have decimated the populations of many birds, including the kiwi, now endangered, and fighting extinction in the wild. So numerous are the possums that you can hardly drive a couple of kilometers without seeing the remains of one that was hit on the road. This is partially because the NZ people, considering them dangerous pests, try to run them down at any opportunity. We had seen many dead possums along the way, but we had never seen a live one. We followed the turquoise river, going steadily downhill. The Lower Buller Gorge had better scenery than the Upper, and the road was more interesting. At one point we came to a spot where the road was hewn into the side of a cliff. There was only one lane, with a sheer rock face on one side and a drop into the river on the other. But the disconcerting thing was that when you started through the single lane cut into the cliff, there was no way to tell if another car was coming from the opposite direction! Further on there was another tricky spot; a one lane bridge off a hairpin turn, with a mirror posted to check around the blind corner for oncoming traffic. And this was the main road! A billboard along the highway showed a photo of a corpse�s foot with a morgue-type toe tag, and a caption which read �Speeding Ticket.� We found this one quite morbid; but then again maybe that was the point. We came to the west coast, and the town of Westport . The coastline was rugged, with large rock formations extending out into the sea, and many small rough islands just off shore. 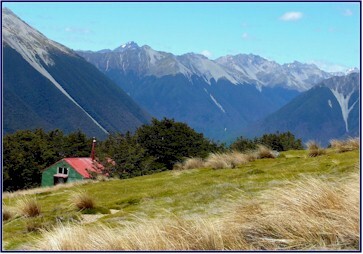 The road was twisty and winding; we followed it south, with the mountains on our left and the Tasman Sea on our right. Hairpin turns doubled back and forth as we climbed up over the shoulders of the mountains, and then dropped sharply back down toward the ocean. 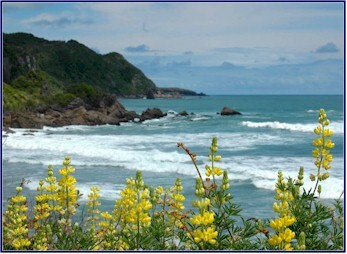 The water was a beautiful blue-green color in the sunlight, with the breakers crashing against the shore. We passed a caution sign for a penguin crossing; you don�t see that every day! 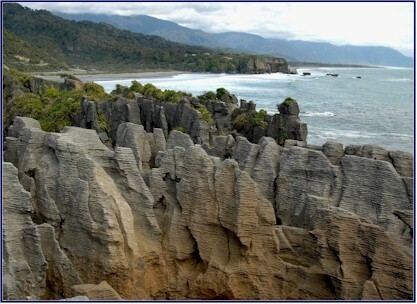 Presently we came to the Paparoa National Park , and to the town of Punakaiki , where we visited the Pancake Rocks. This is an area of the shore where the rocky limestone cliffs have eroded into layers, like vast stacks of pancakes. There are many strange formations, and at high tide, the water comes crashing up through a number of blowholes. It is a popular attraction, something we usually try to avoid in favor of our �road less traveled� policy, and we were a little worried that it might be crowded. But we were pleasantly surprised to find that there were not too many people around; we had gradually come to realize that traveling just before Christmas was a great way to avoid the crowds. We followed a path through the sub-tropical undergrowth, watching for flowers and birds. We saw several large rats among the bushes; more of New Zealand �s imported pests. The path then wound along the shoreline and the cliffs, with many overlooks where you could view the rock formations. We saw the Pancake Rocks from different angles and viewpoints. It was quite unique; the rocks were worn into marvelous shapes, layer upon thin layer forming the cliffs. A colony of gannets nested on a rocky island just out from one of the overlooks. The surf came crashing in, filling the surge pools and spouting through the blowholes. It was quite an impressive sight. We met a pushy guy from Australia who was taking photographs; he offered us much unsolicited advice on photography. He was a pilot for FedEx, and he told us stories about transporting the Melbourne Cup winner and his Asian owner. He seemed to know a lot about photography. And about flying, racing, traveling, gambling, and politics; in fact, he seemed to be quite an expert on every subject that came up. We were happy when we eventually managed to escape him. We went for a short walk on the Truman Track, a path that started through the rainforest, thick with ferns, nikau palms and rimu, and then came out into the open and led down to the sea. The beach consisted of millions of tiny pebbles, on their way to becoming sand, washed perfectly round by the sea. It was extremely difficult to walk on this footing; our feet sunk in and slid backwards with every step. It felt like one of those dreams where you are trying to run but you can�t, and everything is in slow motion. We found that we could walk better if we went right down to the waterline where the sand was wet, but then we were dodging the waves of the incoming tide. We wandered among the overhangs and shallow caves in the cliff face; it was an exotic and alien-looking landscape of rock formations. Next we hiked up the Pororari River Track. It was a pleasant walk along the river, with cliffs rising up on both sides � we considered it a better gorge than the much-touted Buller. We saw a pair of brightly colored Paradise Shelducks with three babies, paddling along in the water. These are attractive duck-like birds brilliantly marked in black, white, chestnut and green; the females have a white head, and the males have more black. We saw several other Shelducks further upstream, and heard their loud and distinctive call as they flew along the river. 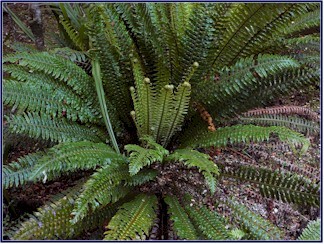 We collected some beautiful NZ ferns, which we intended to smuggle home in our suitcases for my mother Grace; she makes amazing wreathes out of dried plants and flowers, and we were willing to risk fines and imprisonment to bring her the ferns she had requested. We were lucky with the weather. The day had started to cloud over and become gray while we were at Punakaiki, but the rain held off. Then just as we got in the car after our hike, it quite suddenly started to pour. Perfect timing! We arrived at Greymouth at dusk. It is a very gloomy place; even in the guidebooks it has a reputation of not having much to offer. Why does it seem so dreary, we wondered? Perhaps because we have never seen it when it wasn�t raining! We had spent the night there in 2004, and it had been raining then too. For all we knew, it may never have stopped. We had no trouble finding a room; we checked in to the Sundowner Motel. It was comfortable enough, but the d�cor was, well, interesting. The walls were cinderblock, painted lime green, and the carpet was blue and orange striped. The curtains were a different striped pattern, of blue, green, red and yellow, and the bedspread was in plaid squares of all of the above colors, plus pink. The cabinets were brick red, and whoever had chosen the towels had managed to somehow find hues that did not match any of the other colors in the room. Considering the decorator�s taste, it was just as well that there were no pictures hanging on the walls. Perhaps this kaleidoscope of colors was meant to counteract the dreary grey of Greymouth. If so, it had dubious results. We took a tour of the town, looking for Steamers, a restaurant that had been recommended to us. We had a little map, but there were no signs on most of the streets, so we drove around the town center about four times in the pouring rain searching. When we finally found the restaurant, we had an excellent dinner; locally caught fish for Jineen and roasted NZ lamb for me. We returned to the motel for a belated happy hour; we hadn�t done it earlier because we had too much driving to do in the rain. We finished off some Stoneleigh Chardonnay we had opened on the first day (excellent) and sampled the St. Clair Chardonnay (not so good). We sat in our impeccably color-coordinated room, looking at guide books, planning hikes, drinking wine and eating Anzac (acronym for Australian and New Zealand Army Corps) cookies, what could be better? Oh yes, it�s pouring. Can�t have everything! It had rained all night; we had heard it beating down on the roof really hard. The forecast was for steady rain all day, but to our pleasant surprise by morning it had stopped. Maybe we had beaten the odds. We had our first wildlife sighting of the day as we came out of or motel room door � a snail! I photographed it, commenting on what a novelty it was to not have to hurry to get the shot � it wasn�t moving very fast. We went to the supermarket to stock up on happy hour supplies, and to put petrol in the car. On the South Island you never want to let your tank get down past halfway, as the gas stations are few and far between. Our general plan for the overall route on this trip was to roughly circumnavigate the South Island in a counterclockwise direction. On our previous visit we had made a circuit of the central portion of the island; this time we were going much further both north and south, and mostly visiting areas that we had not seen on our first trip. However there is only one road down the west coast, so it was unavoidable that here we would be following some of the same route we had taken before. Not that we minded, because it was a spectacularly beautiful area. And there is so much to see and do that you can�t possibly do it all anyway, so even though we were driving some of the same highway, we were stopping and exploring in very different places. We were heading south on Highway 6, the west coast road. At times the road was quite straight and fast, and in other places it was convoluted and twisty, weaving its way up and down over the lower reaches of the mountains. The highway was quite empty, and we hardly passed another car. We had crossed over many narrow one-lane bridges in our travels through New Zealand ; most of the bridges were built this way. But here something was different - we also had to share with the railroad! The sign said �Give way to trains.� You think?!? It definitely seemed the obvious choice. But these one lane bridges were long and narrow, and you couldn�t really see to the far end to know if a car was coming, much less a train. What were you supposed to do if you were on the bridge and a train was coming? Back up really fast? I just love the graphic road signs in NZ. There was one showing a picture of a bicycle wrecking on a bridge, hitting a bump and sending the rider flying. We continued on the road, looking for a place to access the beach. We turned down several small lanes that turned out not to go to the shore, but we saw some interesting sights nonetheless. We passed a pasture of cows wearing rugs. Some of them also had banged tails. Were they Show cows? Event cows? Learner cows? (I started my riding career on a cow.) Or just wimpy cows? Our imaginations ran wild. We passed through the town of Ross ; I recognized this as where I got my speeding ticket on the last visit. Despite never paying it I wasn�t in jail yet, so that was a good sign. I drove slowly. We pulled out the map and looked for the smallest �yellow� back roads we could find � we like to get off the beaten path and see a side of New Zealand that most visitors never see. We turned on to Bold Head Road , a four wheel drive track. It was a very small unsealed road that went through farmland, and then along the coast through the Kakapotaki Ecological Reserve. We saw a great variety of birdlife on this small road. Jineen got out her NZ bird book, and we identified, among others, spur winged plover, pied oyster catchers and chaffinches. The distinctively colored Paradise Shelducks inhabited the small ponds and marshy areas, and falcons flew along the roadside. We saw pukekos everywhere; these chicken-like blue and black birds are very prevalent in low-lying wet areas. I wondered if people hunted them much for food; I understand they can be rather tough. I read a book before the trip with a recipe for cooking pukeko: Fill a pot with water, add salt and spices to taste, and put an axe (the metal part only) into the pot. Bring the water to a boil, and then add the pukeko bird. Continue to boil until the axe becomes soft, then throw out the bird and eat the axe. Having seen virtually no vehicles on the main road since leaving Greymouth, in about 10 kilometers on this tiny lane we met a school bus, two farm trucks, a road grader and a huge dump truck. The last was almost our undoing, as the shoulder of the road was much softer than it looked. As we pulled off to let the truck by we sank almost to our axles, but fortunately our intrepid little 4WD Honda saved us by managing to crawl back onto the road, amid much wheel spinning. Our little road presently rejoined Highway 6, and we continued south.